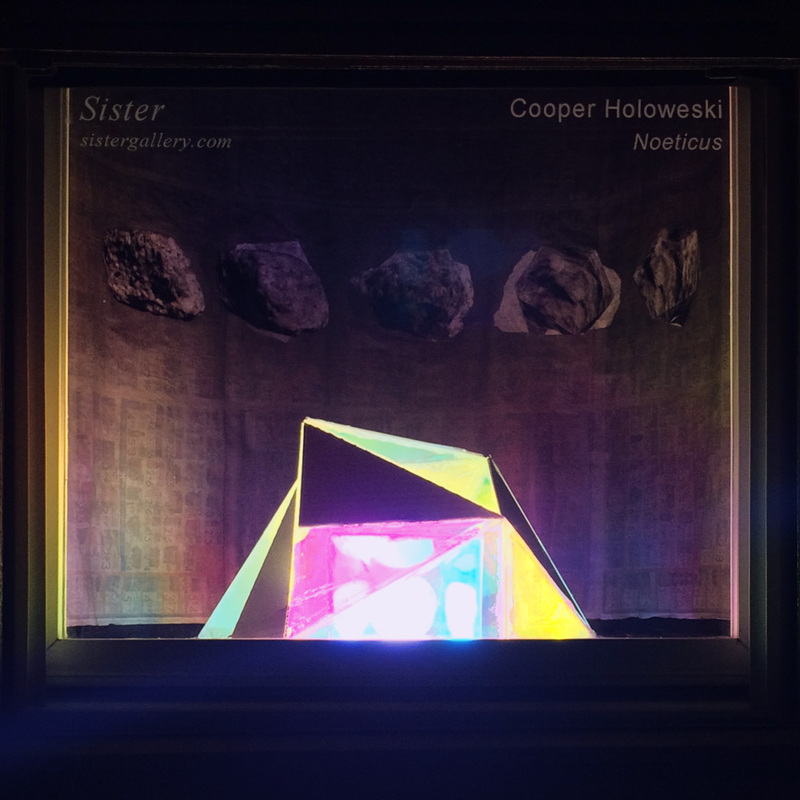 Sister is pleased to present "Noeticus" a new site specific sculptural installation by Cooper Holoweski. Noeticus is a reference to Noetics, a new-age branch of philosophy used in parapsychological research for science-fiction (for instance the X-Men) with a focus on "exploring psychic phenomena and the role of consciousness in the cosmos". For this project Holoweski has created a hard edged geometric sculpture out of cardboard and specialty color-shifting plexiglass that changes depending on the angle of the viewer. Loosely based on the platonic solids (similar to the utopian architecture of Buckminster Fuller) but intimate and ambivalently functional; the object careens between the poles of idealist abstract form and baroque consumer object. He has set this against a diagrammatic backdrop illustrating a rock's transformation into icosahedron that seems to suggest an evolutionary imperative towards an ideal form. Related to the idea of Noetics as a study of "human potentials" the rock becomes a symbolic figure of human progress; set forth with the improbable destination of transcendence but stalled-out somewhere along the way and left to find a new goal or wallow in nostalgia. Cooper Holoweski was born in 1981 in Detroit, Michigan. He holds a BA in political science and BFA in printmaking from the University of Michigan and an MFA from RISD. Cooper was an artist-in-residence at Taller 99 in Santiago, Chile, in 2004 and at Gallery Titanik in Turku, Finland, in 2006. In 2009 he was awarded the RISD/Skowhegan matching grant and attended the Skowhegan School of Painting and Sculpture. His work has been featured at Storefront Bushwick, Famous Accountants, and the Untitled Art Fair. He toured his piece Katabasis, a 40 min. video with live score, at the BRIC House in Brooklyn, Space Gallery in Portland, ME, and the Museum of Contemporary Art Detroit. In 2015, he was awarded the Keyholder Residency at the Lower East Side Printshop.